Ever wanted the chewy, fudgy gloriousness of brownies in cookie form (if you haven’t, WHAT IS WRONG WITH YOU)? Look no further! 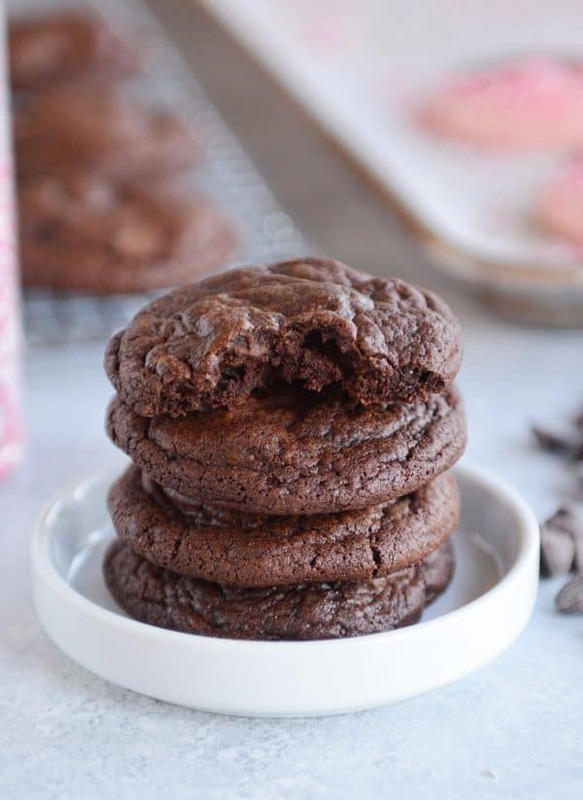 These insanely delicious one-bowl brownie cookies are amazing and completely irresistible! They are definitely up there in probably my top 5 favorite cookies of all time. They are insane. Fudgy. Chewy. Ultra-chocolatey. And just like the best desserts? They are AMAZING straight from the freezer (such dangerous info). If the cookies/recipe look a bit familiar to you, you aren’t imagining things. 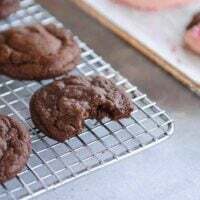 The original recipe was published in the eCookbook I put out several years ago, but I recently decided it was high time to let the entire world have access to these decadent brownie cookies. I’m not exaggerating when I say that these are some of my favorite cookies ever. Everything about them speaks to my soul. Easy? Check (we’re talking one bowl, one wooden spoon kind of easy). Soft and fudgy? Double check.Decadent and richly chocolate? Yep. Check, check, check. If you can melt chocolate and butter, add an egg and a few dry ingredients, you’ve got yourself some of the best cookies on the planet. And look how cute they are fancied up a bit? 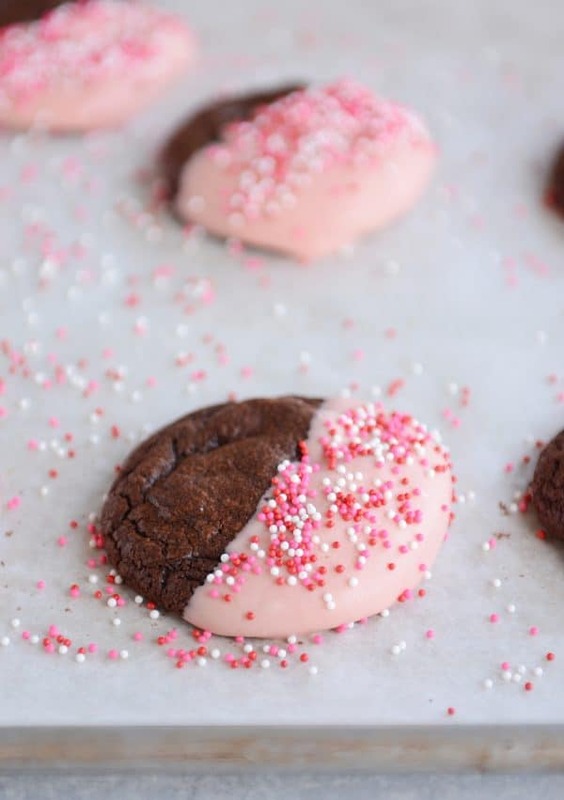 These clearly have a Valentine’s day vibe, but you could put your own spin on how to dip and sprinkle. How elegant would they be dipped half in white chocolate? And then drizzled with dark chocolate. Or sprinkles. The only caution I can give is to not let the adornments overshadow the simple gloriousness of the fudgy brownie cookie itself. 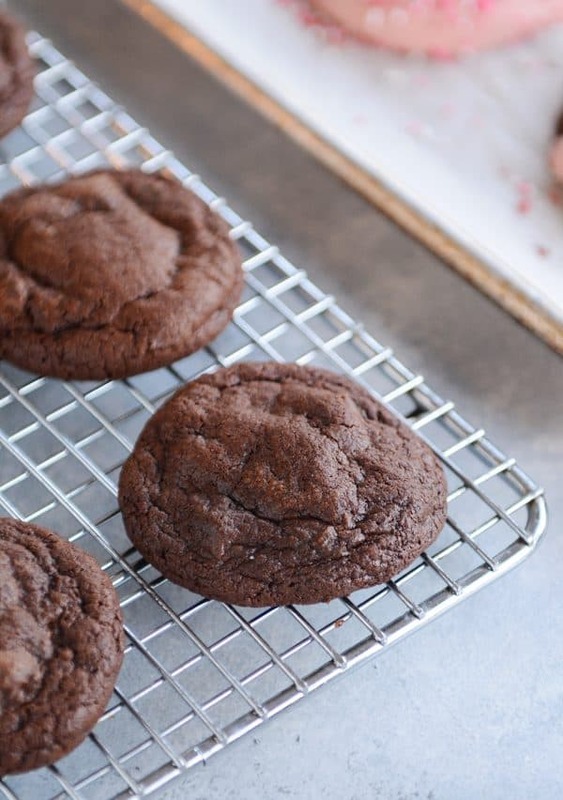 These brownie cookies have been a staple in our lives (and freezer) for years and years. I’m just so happy to finally be sharing them with every last one of you. If you haven’t made them out of the eCookbook yet, let now be the time. And if you have made them, let me know what you think (and then congratulate yourself for being head of the game by making another batch!). You can never have too many brownie cookies. That is a guiding theme of my life. I’ve made these cookies for so many events over the years, and they are met with rave reviews every single time, which should come as absolutely no surprise. An intensely chocolate, fudgy, cookie that’s basically a brownie in cookie form? Yeah, what’s not to love? In a large microwave-safe bowl, melt the butter and bittersweet chocolate chips at 1-minute intervals, stirring in between, until melted and smooth (but not overly warm). Let the mixture cool until room temperature. Add the brown sugar, eggs, and vanilla. Stir until well-combined. Add the flour, cocoa, salt and baking soda. Gently stir until evenly combined (don't overmix). Stir in the chocolate chips. Chill the dough for 1-2 hours until the dough is more firm but not so stiff you can't scoop out the cookie dough. Preheat the oven to 350 degrees F. Line two large, rimmed baking sheets with parchment paper and lightly grease with cooking spray. Scoop out heaping tablespoon-sized portions of dough and roll into balls (I use a medium #40 cookie scoop). Place the cookie dough balls a couple inches apart on the prepared baking sheets (about 12 cookies per sheet). Bake for 9-11 minutes until set around the edges but still soft in the middle (and there are a few cracks on top); don't overbake! Let cool for a couple minutes on the baking sheets before removing to a wire rack to cool completely. Store covered at room temperature for a couple days or freeze for longer (these taste great straight from the freezer!). 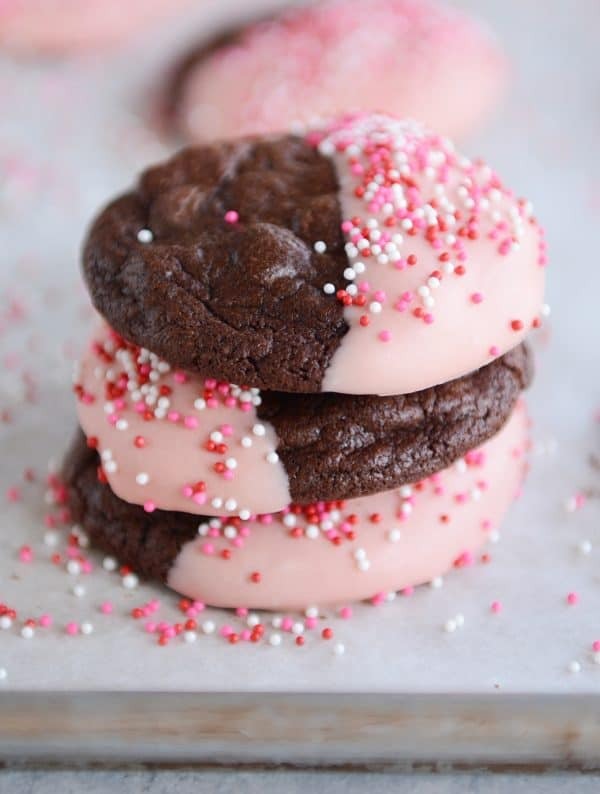 For a festive look, once the cookies are cooled, they can be half dipped in colored candy coating (or white, milk or dark chocolate) with sprinkles added before the chocolate has hardened. ﻿If the cookie dough has chilled long enough that it's too hard to scoop out, let it sit at room temperature for 10-15 minutes to soften up a bit before scooping (or consider scooping the really soft cookie dough mounds onto a parchment sheet and refrigerating that way - then the little mounds of cookie dough could be picked up and rolled into balls after chilling). These were so tasty, Mel! Just like eating a brownie! However, mine spread all over the place, haha! The first batch of cookies (refrigerated about an hour) were very fudgy and gooey and didn’t hold their shape at all when I took them off the pan. The second batch (refrigerated more like two hours) spread even more and were crispy around the edges. Any idea what I did wrong? Thank you so much for all your amazing recipes! You’re amazing! Hey Amber – sounds like you might need to add a bit more flour. That should definitely help! Somehow I just saw this…thanks, Mel! I’ll definitely try that! I added more flour, and mine stayed high and puffy. Delicious!!! We made these on the weekend with our children, they were lovely. Made it with my son today. It was delicious!!! I replaced the vanilla peppermint extract one time, and they were even better!!! Cookies taste good, but like another commenter above noted, my cookies did not spread as much as yours did and get that nice flat top. My cookies spread a little bit, but kind of look more like craggy blobs :/ I followed the recipe as written (by weight) and only refrigerated for about an hour prior to baking. I also baked the second batch after the dough had sat out for ~15 mins at room temp thinking that maybe the dough was too cold, but I think maybe I needed slightly less flour? I kind of wondered about that as I was mixing in the dry ingredients. I’m not sure. Anyway, not quite the appearance I was hoping for, but still tasty. 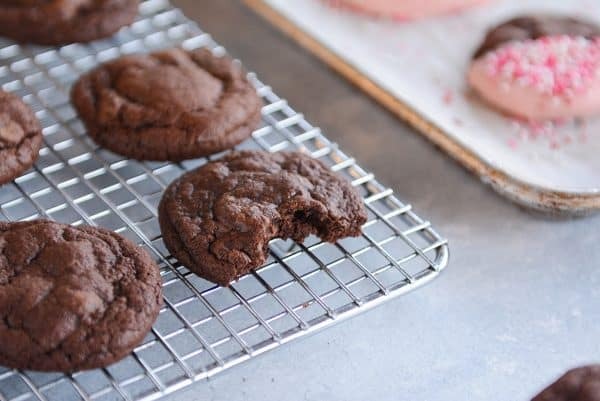 I have been making the same double chocolate chip cookies for 20 years (I found the recipe in a Mrs. Field’s cookbook that I received at one of my wedding showers). They have always been a family favorite. After making these cookies today, I think I will be retiring the Mrs. Field’s receive for good. They are absolutely incredible! These are the double chocolate cookies I’ve always dreamed of. Thank you for another incredible cookie recipe!!! Hello. I only have baking cocoa which I think means it is alkalized. Will that work ? Thank you. These are absolutely delicious! My dough was a bit sticky, even after chilling in the fridge for a couple hours, so I stashed it in the freezer, which worked great. Thank you so much for sharing this recipe. Just made these today with my two youngest because they needed to have their attention focused on something that didn’t involved bubbles and sidewalk chalk inside my home These were delicious and they really enjoyed licking the beaters and bowl. Which bought me even more time. So thank you for my sanity and a delicious treat. I’m all about those sanity-saving treats, Brenda! absolutely divine! truly my favorite cookie ever! definitely now my go to! mine were a little flat so i’ll have to make them again with a bit more flour and see if that plumps them up but if not, who cares?!? Could you replace the all purpose flour, baking soda, and salt with self rising flour? And would the amount be the same? I’m not sure, Brandie – sorry! I don’t use self-rising flour so I’m not familiar with conversions. I appreciate you raising awareness as my little girl is currently battling leukemia! I love your blog and cook from it often. Thanks again! April – I’m so sorry to hear that! You and your daughter will be in my prayers! Just made these tonight and they didn’t spread at all! They’re just mounds of chocolate cookies with cracks on the tops. They still taste good, not quite as fudgy as others have commented, but I’m wondering what happened? I followed the recipe as written using the weights listed. Hey Brianna – hmmm, I’m not positive…is there a chance your oven cooks hot? If so, you might try reducing the oven temp by 25 degrees to see how that goes and maybe skip chilling or don’t chill for as long. Thank you for such a quick response! We live in a rental so the oven temp is anyone’s guess… I will definitely try your tips!! I’ve made these twice now. They’re so good! I was out of vanilla, so I used almond extract (a little less than a teaspoon, because it seemed strong), and it was delicious. Now that I’ve bought more vanilla, I might have to make another batch with that to compare. For research. I made these cookies earlier in the week, thinking I could send them in as a treat for my 8 year old’s school Valentine Party. Ummm… NO. Can you refrigerate the dough and bake them a couple days later? I like to prep as a time saver! Yes! But the dough will be pretty stiff, so you might portion the dough into cookie-sized mounds before refrigerating or else you may need to let the dough warm up a little before scooping. These cookies are soooooooooo yummy. I’ve made them twice already since you posted and am seriously considering making them again tonight. So a couple of years ago I made Bakerella’s Brownie Caramel sandwich cookies. And they were great. But the cookie part ….. wasn’t quite right. I filed it away in my brain under ‘when I find the right brownie cookie’. Well here it is. I remade the deliciousness that is the brownie caramel sandwich cookie for my family today (valentines you know) but using this cookie and it was AMAZING. Highly recommend! A little bit of brownie heaven in a few bites! Fantastic recipe! These were so good, Mel. We were so excited to try them I only let them chill for ~30 minutes and they were great. Perfect treat while we watch the Olympics. Thanks for letting me know you liked these, Sarah! Mel! I made a batch of these for my friend. Well, my husband tried one just now. He said it’s one of the best cookies I’ve ever made. And, not to brag (too much) I make good cookies. He claims they ‘re “top of the line”. And said they should be packaged. This is extra special to me because he’s never really cared for sweets. Thanks Mel. And thanks for your fundraising efforts. Mel, these are fantastic. Made them yesterday for a Valentine treat for last night’s yoga class. We all loved them. I have a tendency to over bake brownie like things as I am afraid of being left with gooey insides, but I baked these exactly 10 minutes, rotating halfway through and they were perfectly cooked and soft. I really wanted to dip them in pink discs and sprinkles like you did, but ran out of time to go out and buy the them–next time! Thank you for this awesome recipe. And Happy Birthday!!! Great recipe, Mel! I added chopped Andes mints, replacing the regular chocolate chips added at the end. Very delicious. I’m not certain I’ll have any left to freeze, but that’s a great idea! Love this idea of adding mint – yum! I made these tonight and subbed the last 1/2 cup of chocolate chips for some salted caramel chips I found at my local grocery store, which made them salted caramel brownie cookies. They are delicious! I probably underbaked them by a minute or so (9 minutes) and they are perfectly gooey in the middle…just like I wanted them to be. Oh my heavens, that sounds amazing!! Mel, these are amazing! My kids and I dipped them in white chocolate with sprinkles, and left some plain for my husband. We all loved them! Even my husband, who said while I was making them, “why can’t you just make regular brownies?” just devoured at least 1/2 dozen. Thanks for another great recipe! And Happy Birthday!!! Mel: Thank you so much for this recipe. These cookies are excellent! I doubled it, as my teen children are obsessed with cookies. They will probably be gone in a few days! Glad they were a hit, Kelly! Like brownies in cookie form. The dough is so delicious it is almost better than the cooked cookies. I ate these warm with some vanilla ice cream and it was amazing! I love that you love them warmed up, too. Divine! I knew I had to try these once you said they taste great right out of the freezer! I made them last night and they might be my new favorite! My daughter asked if we could make them again today! 🙂 Thanks so much, Mel! Ha! I’m so sorry, today isn’t your birthday is it? I was going off of your Double Chocolate Mousse Tart post that mentioned your birthday and didn’t realize it was updated. Awkward!! But I meant what I said!! Love you Mel!!! Mel, I think today is your birthday. If I’m right, Happy Birthday!!! . Thanks for all the hard work you put into your recipes and posts. I truly appreciate it every time you answer a question of mine and you always answer it so thoroughly. You’re awesome!! Thank you so much, Kaytee…means a lot to me! Bravo! I made these today for a boy scout event and after tasting one I think they will go fast. Very easy to make and I loved how soft they were. If you are craving chocolate, these will hit the spot. Thank you again for supporting such a wonderful cause and, as always, for all your wonderful recipes! Thank you for sharing that, Adri! I am so happy to hear your daughter is in remission, but thanks for the reminder that pediatric cancer research needs more funding and attention! Hi Mel, this recipe sounds right up my alley! I love walnuts in my brownies, have you ever made these with nuts added to the batter? What about adding a little coffee or espresso powder? I can’t wait to make these. Thanks again! I made these yesterday & added chopped walnuts to half of them. Sooooo Goooood!!!! Tastes just like a brownie. I haven’t tried either, but I suspect both variations would work well! Thank you for this! As a pediatric oncology nurse for over 17 years, any and all ways to raise awareness and money for these kids is much appreciated. And my daughter (chocoholic) is going to love these cookies. Made these todAy and they are perfection. My kids and their friend loved them!!!! I made these last night, and they taste great! Only problem is that they came out super flat, not nice and pretty like the pictures. Any idea on why? Is it an elevation thing – do I need more flour? Hey Kendal – try adding a couple tablespoons more flour (do you live at high elevation?). I used 2/3 semisweet chocolate, 1/3 unsweetened chocolate (because that is what I had). These are amazing! Made these today for after school snack. Everyone loved them! Best after school snack ever! so yummy looking! Do you know how many a recipe makes? I need about 80 of these (only 33 for myself though :). Becky, Mel puts the servings right above the name of the recipe. This recipe is for 24 cookies! These have been winners at our house ever since I bought the eCookbook awhile back. They really are the perfect cookie! I made them again today and as usual the disappeared pretty fast! These cookies look delicious! I will be making them soon. I’m so excited to be participating in this great cause with you. Mel, I saw something called Wilton Candy Melts online. Would this work if I got the pink color? Since I have never used candy coating, I wasn’t sure if this was it. Yes we dip stuff in those often! A cookie after my own heart. I am so baking this cookies today. I am a hug brownie lover and I’m so happy to have found another, you are rocking this cookies. Thank you, Mel! I love when you share about organizations that are truly making a difference. I’m thinking I need to make these. I’m a chocoholic and a brownie lover. =). I’m thinking my family would love these! Ever tried stirring in mint chocolate chips? Or dipping in mint chocolate? No, but I think it would be delicious!! These are every bit as amazing as you say they are! I bought the eCookbook and have made them several times. They are actually magical I think. I made them as a bribe for people to come to ward choir practice and every single one of them were devoured and they begged me to bring them again. We had more people come to choir that year than we ever had before! They are the perfect, non messy version of brownies. Mel, you made my night! After reading your recipe, I was wondering if I had all the ingredients. Checked the fridge…whew! Two eggs left! Hmm…do I have any cocoa powder? Whew! Just enough! Everything needed was already on hand. What a delight! The perfect cookies for watching the Olympics. Thanks for another winner! Thanks, Kasey! Glad you liked them! And yay to the Olympics!! I’m so excited. These look soooo good! Happy to be part of this blogger fundraiser with you! Just had to make these when I saw the pics! Super yummy!!!!! And so easy too! Thanks for making them and checking back in so fast I let me know! So happy you loved them! These cookies look so delicious and fudgy just like you described. I need to try these for my husband. YUM!!! If you have not heard of the Miracle Party for cancer kids check it out. Hey Mel! Thanks for posting the recipe! I do have one question and am probably alone in this corner. I don’t like biting into a cookie or brownie to find something hard, such as a chocolate chip or chunk. Do you think these cookies would turn out good if I leave out the 1/2 cup of chocolate chips added to the dough or would it work if I melted them and stirred that into the dough? I really want to try this recipe but don’t want unmelted chips in the end result! Any advice? Yeah, you could definitely just leave them out! These are fantastic cookies!!! They are just one of the many reasons to buy Mel’s cookbook. I LOVE your cookbook!! Thank you so much, Suzanne!! Be good with peanut butter chips! These look right my tastebuds’ alley! Can’t wait to try them, thanks for sharing!!! This looks like the brownie half of your Brookie recipe (which I am teaching the YW to make at our next activity!). I can’t believe I never tried baking that dough as just a brownie cookie by itself! Yum!!!! Mel, I have to tell you how much this post means to me. I have been reading and cooking from your blog for years and years, and to see a blogger that I love contribute to a cause dear to my heart brought tears to my eyes. I used to wonder when cancer would touch my family, but I never imagined that it would touch one of my children. My sweet daughter Lucy was diagnosed with a rare form of pediatric brain cancer called DIPG in August 2016 when she was 5 years old. It was terminal upon diagnosis, and after a truly beautiful year she passed away on September 23, 2017. Before Lucy got cancer I was one of the people who truly had no idea that childhood cancer could be so devastating. I had no idea it was so under funded. Now I know better, and I appreciate organizations like the one you are supporting, for the work they do to promote childhood cancer research. The treatment protocol for my daughter’s cancer has been essentially unchanged in half a century. No new treatments have been developed for it because there is simply not enough money for research. Hundreds of kids in the United States alone get DIPG each year, and the average survival after diagnosis is only 9 months. Thank you for doing something to contribute towards progress for childhood cancer research. You don’t know me, but this truly means the world to me. I am so very sorry for the loss of your sweet, Lucy! Your story is terribly heartbreaking & necessary to hear. So many of us have no idea just how underfunded these programs are & how easily it could be a little one in our own families. Thank u so very much for sharing, Vicky. Vicky, thank you for sharing your story to help raise awareness. My heart breaks for you. God bless you and your family! Yes!! Do you generally melt chocolate chips or use a bar like Bakers? Also, for the chocolate chips added later are they semi sweet, milk or bittersweet? My daughters will love these. Haha, I like that philosophy, Andrea. 🙂 Plus, that’s awesome if you skipped the chilling and the world didn’t end (haha!). Just last week when I was making your one-bowl brownies (which were delicious even with GF flour), I thought does Mel have a recipe for brownie cookies? So glad you read my mind! Anna, do you use a GF flour that already has xanthan gum in it or do you add any xantham gum when you make these GF (also when you make the one-bowl brownies GF?)? Thanks! I haven’t made these GF (I myself am not GF – so I make it that way if a friend/family member is GF) but when I made the one-bowl brownies and in general when I substitute GF flour I use a multipurpose flour with xantham gum (like Pilsbury gluten free multipurpose flour, cup4cup, or King Arthur). I personally think brownies are the best option to do the substitution because they have less flour – because most of the time when my sister tells me I won’t be able to taste a difference in gluten-free baked goods, I can tell from the texture!